Newspapers Atlantic recognized LighthouseNOW staff for their work at a gala this past weekend. The Newspapers Atlantic Better Newspapers Awards gala took place on June 3. LighthouseNOW Progress Bulletin took home the top award for General Excellence in their circulation class. The newspaper was up against standing finalists the Inverness Oran and Tri-County Vanguard. The editorial team was also awarded in the category of Best Community Engagement for their series - How We Live. The series was headed up by former editor Emma Smith, who recently left the newspaper for a new position at CBC Halifax. The multi-week feature included photos and video from staff and freelancers, encompassing stories about life and housing on the South Shore. The evening also saw Lynn Hennigar, former owner and publisher of LighthouseNOW recognized for her work both with the newspaper as well as with Newspapers Atlantic. Hennigar, treasurer with Newspapers Altantic, recently retired from the newspaper business but took part in the festivities with her colleagues. Reporter Michael Lee was a standing finalist in three categories including Outstanding Investigative Story, Outstanding Sports Photo, and Ourstanding Feature Photo. Reporter Keith Corcoran was a standing finalist in the Outstanding Photo Essay Category and reporter Brittany Wentzell was a standing finalist in the category of Outstanding Sports Photo. Former LighthouseNOW reporter Evan Bower was a finalist in the categories of Outstanding Editorial and Outstanding Sports Story. Helen Dalton, a designer for LighthouseNOW and Advocate Media Inc. took home an award as well for an advertisement she designed for Advocate's Truro Hub Now. LighthouseNOW designer Tanya Barry was also a standing finalist for Outstanding Page Design. The newspaper was also recently recognized by News Media Canada in the Canadian Community Newspaper Awards. 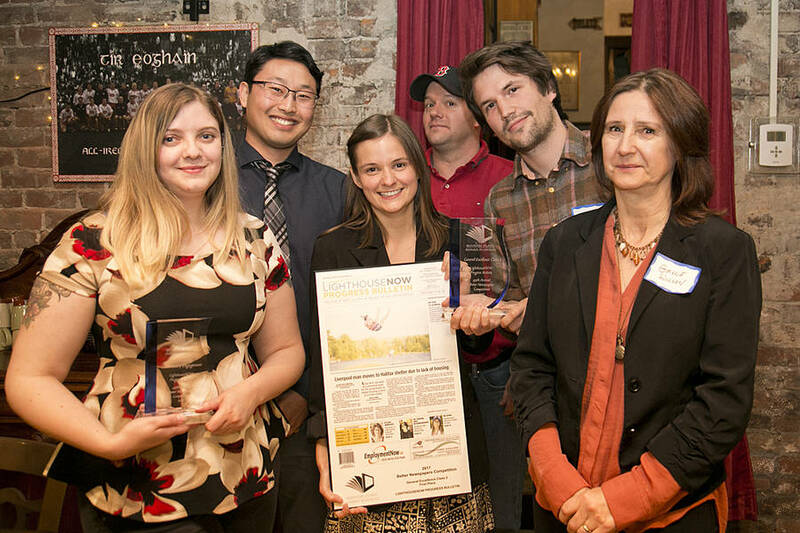 LighthouseNOW ranked second in its circulation class in three different categories, including Best All-Around Newspaper, Best Front Page, and Best Editorial Page. LighthouseNOW was the only Nova Scotian newspaper represented in those awards.